Welcome to Mount Victory Camp Eco-Lodge! Come experience the relaxed country lifestyle of a lush forested farm valley on St. Croix's beautiful west end. -A great place for all types of travelers! A romantic couple's getaway, fun family lodging, and also an ideal place for groups. -A great base camp for hiking, mountain biking, horseback riding, snorkeling, or just exploring the many tropical natural areas of beautiful St. Croix. 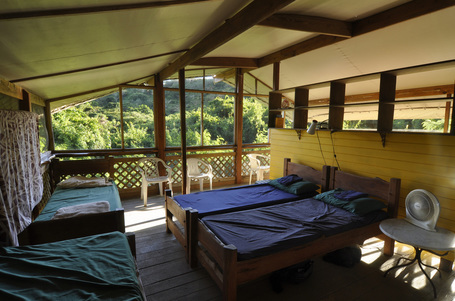 -In addition to offering great eco-lodging, Mount Victory Camp is also the home of Caribbean Earth Skills, a wilderness skills school offering workshops and week-long experiences for youth and adults. -A variety of lodging options….from camping to glamping! -Great for individual getaways or group camp-outs. Unique island dwellings made from storm-felled local tropical hardwoods.